Your whole life you have been dreaming about your wedding as the most spectacular and amazing day of your life! But, as the big day comes closer you realize you simply do not have the time to plan it properly. This all inclusive package is the right choice for you and your family. This is the package you need for a worry free preparation for your wedding day. All you need to do is show up, take the bouquet and walk the aisle! We take care of the entire evening, from the minister to the music, flowers, decorations, buffet and cake afterward, while you relax and circulate with your guests. We even clean up after. Adjourn to a luxury log cabin for a two night honeymoon, included in your package. It comes with a three night honeymoon, allowing you to be on location during the fun part: the decorating! Or, if you prefer, you may spend your time getting your hair and nails done. For your convenience, you can arrive ten minutes before the ceremony (so we can hand you the bridal bouquet) and simply walk the aisle when the traditional wedding music begins. We will take care of the decorating, chair rental, and ordering---we will also coordinate all the details prior to your arrival. You still have control of the colors, special touches you want to add, and the overall theme (we need extra notice if you have something unusual in mind). The minister and groom and groomsmen will be lined up and waiting for you as you make a grand entrance! Wedding hostesses will be on hand to coordinate the proceedings for you and the groom and up to fifty guests. 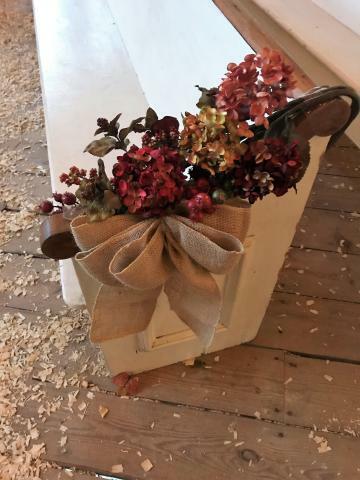 We include your wedding bouquet and flowers for two bridesmaids, along with matching boutonnieres for the groom and two of his groomsmen (additional flowers may be added with advanced notice). This price also includes a three tiered cake, gourmet salted nuts, sparkling juice (or bring your own Champagne) and catering for up to fifty guests! The menu includes beef or pork, barbecued beans and coleslaw, and dinner rolls. There will be iced tea or lemonade for your family and friends. 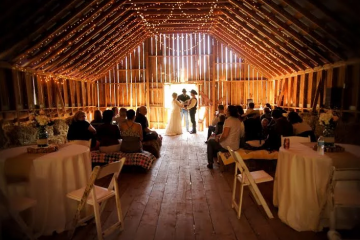 Plenty of time is allowed for everything: the ceremony, wedding toast, cake cutting, dinner, time around the outside fire ring and time to mingle. So no worries; we will break it all down and clean up after, while you adjourn to the romantic luxury of your honeymoon cabin! This all inclusive package only $3499 with sales tax included. A deposit of 50% ($1749.50) on VS, MC or DS is all you need to reserve a specific date and time. The last half of your deposit may be paid in increments over time, but must be paid in full 30 days in advance of your wedding day. We have additional cabins for couples who may need lodging for two nights during your time in Eureka Springs. Please mention the name of bride and groom when scheduling to get the best price possible. Each additional guest beyond the allotted headcount included in any package may be added for $5 plus tax. On a wedding with catering, each additional guest is $20. We need an accurate head count two weeks before the date of the wedding.